MyForce helps companies and organisations in need of a modern security solution: using our advanced voice biometrics solution and algorithms, a person’s unique voiceprint can be used for identification and authentication. The result is a highly secure, multi-purpose solution which can be used to enhance and improve identification and authentication flows in the security and banking/financial sector, intelligence/defense and counterterrorism police units, and so on. The technology is language-, accent-, text-, and channel-independent. A customer-friendly, highly accurate, and cost- and time-saving solution: our voice biometrics solution enables you to simplify and improve traditional identification methods. The requirement of remembering a password or responding to a series of security questions is simply replaced by the unique sound of your voice. Combine our voice-as-a-password technology with another method of authentication, and you’ll have a two-factor ID process that's less tedious to use. The technology can even be applied in the background: just let someone talk over the phone, and his/her voiceprint will automatically be matched with the voiceprint stored in your database. Very easy, indeed. Gone are the days when people could pretend to be someone else over the phone: by storing a unique voiceprint of everyone who ever contacted you, it is very easy to match voiceprints – thus automatically verifying if the caller is speaking the truth or not – and take necessary steps if needed. Our platform is specifically designed to provide police forces and forensic experts with a highly accurate speaker identification tool for use in intelligence/defense or counterterrorism projects. 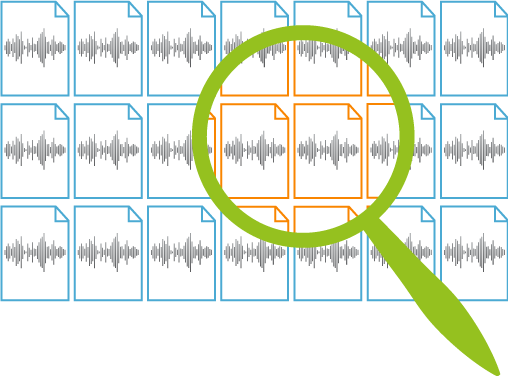 A scalable architecture, combined with quick and efficient processing algorithms, allow sifting through tens of thousands of voiceprints in mere milliseconds. The result: an incredibly powerful crime-fighting tool.